POITOU, FRANCE – Whoa! What’s this? The Dow popped up nearly 400 points yesterday. It is now just 4% off its all-time high of 26,616, reached on January 26 of this year. Markets are either going up or going down. According to Dow theory, a market goes down after it hits its high for the cycle. We had previously predicted that the high on January 26 would be the peak of the current cycle, and that the “primary trend” for stocks would, therefore, be down for the foreseeable future. But we like the drama of it… and the big-picture view it gives us. It helps us recognize the long, large sweeps in market history, and reminds us that the most important thing is to be in the right place at the right time. The latest place to be was in U.S. stocks, which ran up from under 1,000 on the Dow in 1982 to the aforementioned all-time high in January. You didn’t have to know anything more. You didn’t have to do any real research. All you had to do was get on that train in August 1982 and stay on board. 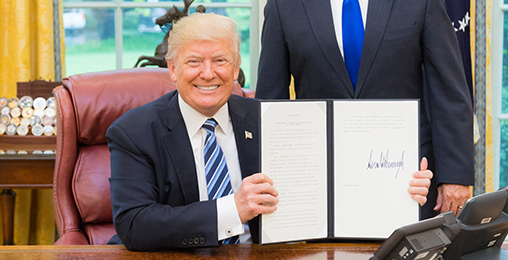 Recently, President Trump signed an executive order that mandates the Interior Department to begin mapping the country to locate America’s “Brandt Oil” reserves. “Brandt Oil” is a new, clean super fuel that’s so powerful, less than two gallons worth contains enough raw energy to power your house for nine years. So it’s no surprise “Brandt Oil” applications are going mainstream. And just like any new energy revolution, early investors are minting millions. Already we’re seeing investors bag rare gains as high as 2,343%, 3,750%, and even 4,628%. Of course, conductors get drunk… trees fall on the tracks… and trains run off the rails. And the Ol’ Cannonball that pulls out of Washington’s Union Station at 6:07 a.m. for the run to New York’s Pennsylvania Station then turns around and goes the other way at 12:02 p.m.
Markets are not so regular or predictable. Still, after January, it looked like we were headed for a long ride back down the line. But the financial press reports that two things emboldened investors yesterday and may have turned the train around – Walmart’s latest results and the upcoming trade talks with China. Hmmm. We stop. We listen. We put our ear to the rail… trying to hear what’s coming down the track. Walmart’s sales were up 4.5% year-over-year. But where did these sales come from? People might spend more if they had more to spend. But despite the statistical noise on the subject, real wages – for the people who shop at Walmart – have gone nowhere. Or to be more precise, the real average wage has risen – are you sitting down? – by a grand total of 13 cents an hour annually, since the beginning of this century. Looking more carefully at the numbers, we find that the best-paid workers (those in the top 10% of wage earners) made progress; their earnings rose 16% since 2000. In seasonally adjusted current dollars, median usual weekly earnings rose from $232 in the first quarter of 1979 (when the data series began) to $879 in the second quarter of this year, which might sound like a lot. But in real, inflation-adjusted terms, the median has barely budged over that period: That $232 in 1979 had the same purchasing power as $840 in today’s dollars. That means that most people – including most people who shop at Walmart – haven’t had a real wage increase in 40 years. And with a more honest accounting for inflation, many must have actually lost real purchasing power. It appears when three major forces collide. As a result, the laws of risk and reward reverse. And the gains that are generated are incredible – both in their return and the speed in which they’re created. This is part of a large, long trend, too. Perhaps the lack of real wage growth could be explained by stagnant productivity. If workers don’t produce more, why should they be paid more? But since the mid-1970s, employee productivity has doubled, according to the government’s own calculations. That is, the average worker can produce twice as much in an hour today as he did in 1976. Until then, productivity increases were shared between workers and capitalists, with the larger part going to the employees. Since then, the workers have gotten none of the gains. Adjusted for inflation, wages are no higher today than they were in 1975. And that’s using the feds’ calculations of inflation. Using a more honest adjustment (without the “hedonic” flimflam), in most places in America, the typical man today earns less real money than he did 40 years ago. Nothing has happened recently that would change that trend. Most of the new jobs created are part-time in low-paying industries. And the direct benefits from the tax cut went to the wealthiest part of the population. In fact, the trend has gotten worse. As reported previously in this space, prices are now increasing faster than wages. Wages were said to be increasing – on average – by just 2.2%. This leaves the typical working stiff with less purchasing power. Again, those are averages. For people who shop at Walmart, the numbers are probably worse. So what’s behind Walmart’s higher sales? Why is it good news for investors, generally? Does it herald a stronger economy? A clue in the Walmart earnings report was e-commerce data. Walmart’s e-commerce sales had jumped 40% year-over-year. With no real rise in incomes, those sales, too, had to come from other retailers. Shares of U.S retail chain J.C. Penney sank below $2 for the first time on Thursday after it forecast a wider-than-expected full-year loss and posted disappointing results on the back of price cuts across product lines. The company’s shares fell more than 20 percent to $1.92 in trading before the bell, its lowest since listing on the New York Stock Exchange a week before the launch of the Great Depression in 1929. The company said it now expected a loss of between $1 per share and 80 cents per share, much bigger than its previously estimated range of a 7 cent loss to a 13 cent profit. One goes up, another goes down. Overall, the economy won’t benefit. And it is no reason for a broad re-pricing of U.S. equities. 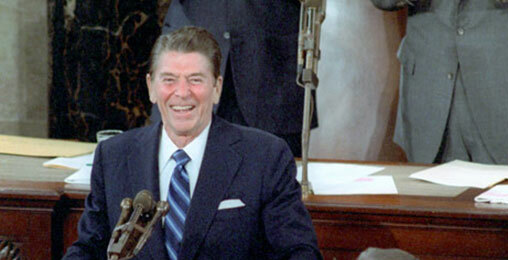 Before Reagan left office, he never had a chance to implement his boldest idea. Today, it has resurfaced, and it’s about to make some Americans very rich. But there is something else going on… which brings us to the second alleged cause for joy: discussions with the Chinese. So far, Mr. Trump’s trade war has succeeded only in raising consumer prices and increasing global tensions. Walmart gets its “everyday low prices” from China. It doesn’t help that China is “enemy number one” in The Donald’s trade war. Price increases alone probably account for half of Walmart’s reported 4.5% hike in same-store sales. Further evidence comes from the fact that the company’s gross margins are actually shrinking. Walmart is selling more… but making less on each sale. The company tries to keep customers happy and sales rising by squeezing its own margins. But what if the Trump team actually does negotiate a better deal with China? Won’t that revive U.S. exporters? Aren’t the Chinese eager to buy “Made in America” Chevrolets and Fords? Will it help Walmart? Not likely. Here, too, the trade deficit with China is part of a long-term trend. The Chinese make things cheaper… and often better. If they see something really selling in China, they knock it off and make their own version of it. A trade deal is unlikely to change the trend. Before Trump’s trade war started, the World Bank put China’s average trade-weighted tariff at just 3.5%. Even if that went to zero, it wouldn’t have a substantial impact on the U.S. economy (although lower prices might help prop up Walmart and household consumption). Besides, in Trump’s mind, you only win by making someone else lose. And free trade might benefit China’s export machine more than America’s consumption-dependent economy. We doubt there will be any free trade agreement coming; we doubt Trump even wants one. Today’s chart illustrates that. 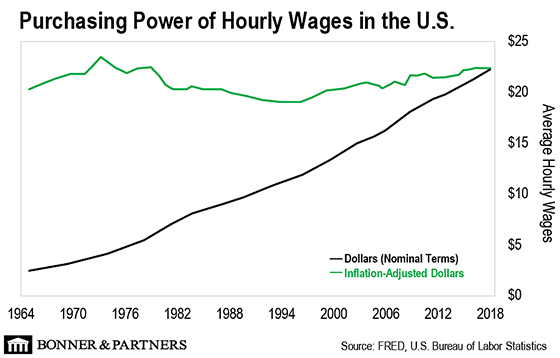 It maps the average hourly wage in current dollars against the same hourly wage in inflation-adjusted dollars from 1964 to today. As you can see, the numbers on the paycheck keep getting bigger. The average American made $2.50 per hour in 1964, compared to $22.65 per hour today. In other words, the paycheck may have gotten bigger… but the amount of goods and services that paycheck can buy has not increased in 40 years. As Bill has warned in these pages, the economic turmoil in Turkey will have ripple effects throughout the world. History seems to confirm this. In 1997, a handful of Asian currencies collapsed. It wasn’t until October of that year that trouble made its way home… and U.S. stocks took a plunge. For decades, European tech companies have failed to keep pace with their American counterparts. Of the 20 largest tech companies in the world, 12 are American. The remaining eight are Chinese. But now, with public sentiment turning on Silicon Valley, and Chinese companies struggling to expand outside their borders, Europe has a fighting chance. Is Big Tech too big? Technology firms like Google and Facebook have provided the world with fast, free services like online search and social media. But their success has brought them power… and made them a target for ambitious politicians. The Turkish leader is a dictator, leading to the deaths of many. How did you miss this? You’re part of the problem, leading Americans to a place of no return. Your article on Turkey, like many of your analytical pieces, is too narrowly focused. You have no idea what other objectives are being addressed through specific actions taken. Many actions are connected to issues you know nothing about, and you make yourself look foolish. Bill, I’m surprised that you missed something in old American history. In the paragraph above taken from the Diary, the difference you will see is that when someone traveling anywhere in the world in the old days – when old America was not the America of today – was arrested and incarcerated, an army was formed here and sent there to get him or her out. No matter whether one or many. In the 1800s, we were the healthiest nation in the world, and it was fashionable to fast one day a week, as I do. We had the least amount of crime per capital. This one ought to get all of you. We were the wealthiest nation in the world. I fear that those who are running this new America are messing up a bit. And all highly urban places are sinkholes (a polite term). So if I were looking for a bolthole for pleasant living (and to sort of hide from the coming civil war), I would be looking within three quarters of a day from a sink hole, international airport, national border, or harbor, but a rural area with reasonable water (rain), temperate weather, and not many landed European antecedents. That only leaves the rural central and mid-northern coast of California on a year-round river, and buy a seaworthy boat. Hi Dan, if you’re considering the Northwest Florida Panhandle (the cities and communities in Santa Rosa and Escambia counties, specifically) for its low cost of living, low tax rates, no state income tax, no tax on groceries, and reasonable housing/land prices (in some areas, anyway), drive on down and let me show you around. Editor’s Note: Do you have a recommendation for Dan as he sets out to uncover the great American bolthole? 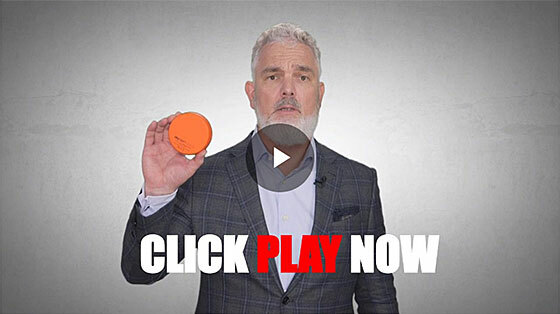 Catch up on Dan’s message to readers right here, then write in with your thoughts. Regular readers will know Jeff Brown as Bill’s go-to technology expert. In February 2016, Jeff recommended the best-performing stock in the S&P 500… Nvidia, up 212% that year, and 680% since then. Jeff has also made individual recommendations that have climbed as high as 205%, 211%, and even 254%… all in little more than 18 months. Now, Jeff is making another bold prediction. And if you’re interested in potentially doubling or tripling your money, you should hear what he has to say.